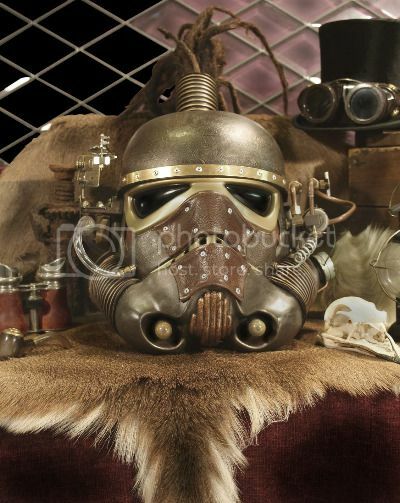 The 501st‘s TK Helmet Project has produced this custom Stormtrooper helmet. 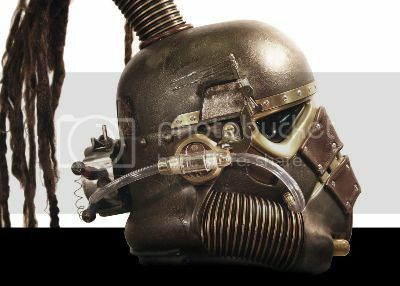 Sure, the internet has seen 1,037 different artistic takes on the Stormtrooper helmet, but when I saw this custom-made steampunk variation, I knew I had to post it. Not because I’m particularly enthralled by steampunk, but because I know some of you are, and I love it when you flip your sh*t. It’s amazing what some brass, pipes, and leather will do to some people. Well, not so much “amazing” as “annoying” in some cases. Unless you’re also enamored with people who act like over-eager fake-adventuring nerds from the Victorian era. As far as materials, we used a real variety. Leather, brass, plastic. copper and black walnut were predominate. Acrylic paint was applied to the basic form of the helmet, and found objects (boy, those were wonderful surprises!) made a huge difference. I think the addition of real human hair added another level and dimension.